Much like everything we use, the methodology of relational analysis is manual. Some relational analysis, like geospatial analysis started centuries ago when a doctor from a township in England was trying to discover the reason for an outbreak in dysentery. By using a map of all the fresh water wells in the town and plotting which wells the victims used, this Doctor identified a cluster of related wells all the victims had in common and produced the first discovered geospatial cluster chart. To understand how analytical software identifies clusters of related entities, and the determines the strength of those relationships, it's important to understand the manual method of association analysis called the association matrix. 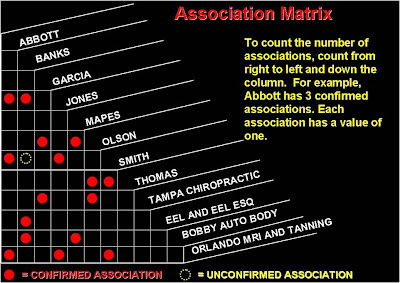 Before software, the association matrix was utilized to find commonalities between entities and an event to determine which entities has the strongest association to the event. The method is very easy to use and is still practical today for conducting field analysis by investigators on the fly without any software. The process starts by drawing a matrix on a piece of graph paper as illustrated below. Each of the entities involved in the event are listed on the matrix as you review the data or documents. On each occurrence that is discovered a relationship by two or more of the entities, a circle is placed on the grid to establish that relationship. A solid circle indicates a confirmed relationship and a dotted circle indicates an unconfirmed association as illustrated below. On completion of the association matrix, you can add the total number of explicit and implicit associations at the bottom of the grid to determine centrality or closeness, principals of current social networking analysis. By translating the association matrix into a visualization, we can see how analytical software through automation, utilizes this theory to show association charts.